Dwariko von Sommaruga is an illustrator of children's books and died in 2010. Both of the creators were followers of Bhagwan Shree Rajneesh (Osho). The major arcana are referred to as Life Songs. Some of the major arcana have also been renamed: Luminary (Hierophant), Renewal (Temperance), Beyond Judgement (Judgement) and Homecoming (World). The court cards are referred to as Shell Songs, the other minor arcana cards are referred to as Hearth Songs and are based on numerology, the author recommends to lay the cards out by suit when reading about the cards to see the numerological pattern. The suits have been renamed: Earth Songs (Pentacles), Flame Songs (Wands), Wave Songs (Cups) and Wind Songs (Swords).The names of the courts have also been changed to Innocence (Page/Princess), Awakening (Knight/Prince), Creating (Queen), Resolving (King). 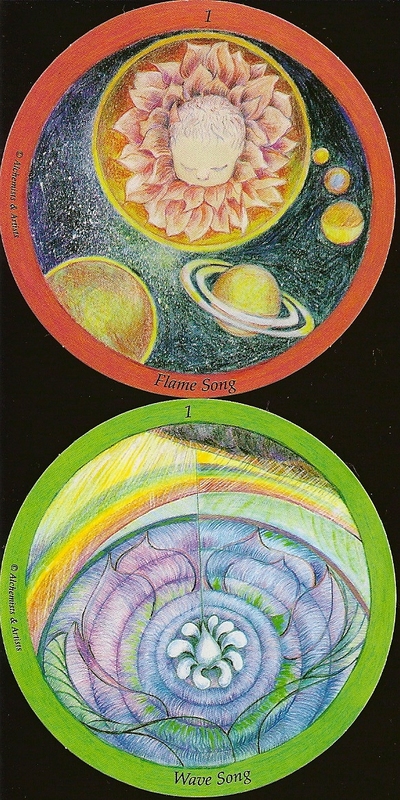 These cards are round ( 73mm diameter ) and the artwork is done in coloured pencil. They came in a cardboard box with a LWB. A 198 page book Songs for the Journey Home is separately available.